Bassist Michael Bisio and pianist Matthew Shipp's Floating Ice is a rather beautiful recording. It's a collection of conversations between two masterful improvisors, and the album's sound is well represented by the title. There is a delicacy to the intertwining acoustic instruments. Mostly eschewing extended techniques, and working within the more established parameters of melody and rhythm, the music made is like the same element but in different states. Ice, floating on water, connected by nature, but existing fully formed on their own. Shipp, who I often associate with angular patterns and strong rhythmic statements can often be found here in a more lyrical mode. Using the keyboard to its fullest, his harmonies and accents can be subtly jarring and equally soothing. 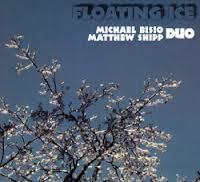 Bisio's role as a co-creator is well fulfilled, as his bass often provides countermelody to Shipp (or vice versus), accentuating and leading the songs in new directions. A particular favorite part is his energetic rumblings on 'Swing Laser.' the piano's frenetic runs are more than counter balanced with the basses ebullient passages, replete with fret board slaps, slides and other interesting devices. When Bisio switches to the bow towards the tune's end, he is unstoppable -- and wonderfully so. Quite a nice recording. The overall sound is captured elegantly, as you can even make out the musicians' faint breaths through the crystalline production. The energy alone makes it a joy to recommend.